US Marine CorpsUS Marine Corps Cpl. 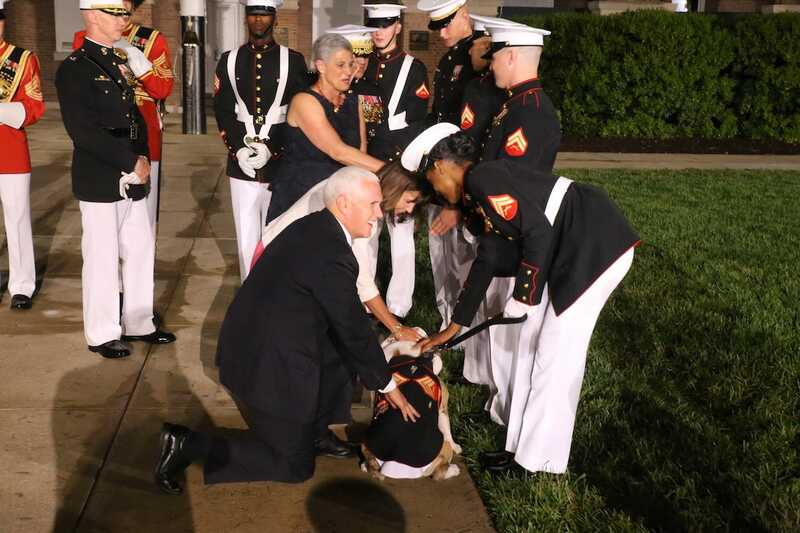 Tyler Blattler, mascot handler, Marine Barracks Washington, escorts Cpl. 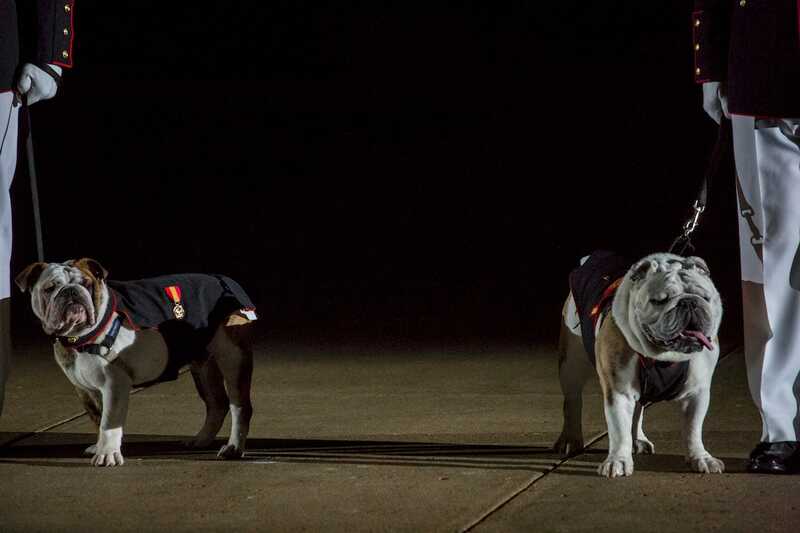 Chesty XIV, official Marine Corps mascot, during an evening parade in Colonel Truman W. Crawford Hall at Marine Barracks Washington, Washington, D.C., August 11, 2017. 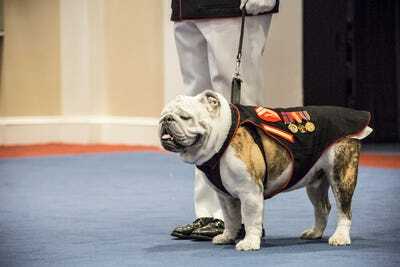 The US Marine Corps’ adorable mascot, the English bulldog named Chesty XIV, officially retired in late August after five years of service. He was replaced by Chesty XV, who made his first official appearance at a Marine Barracks parade on Aug. 31. It’s rather well-known that the Corps loves English bulldogs, but what’s less well-known is why. It all traces back to the famous World War I Battle of Belleau Wood. 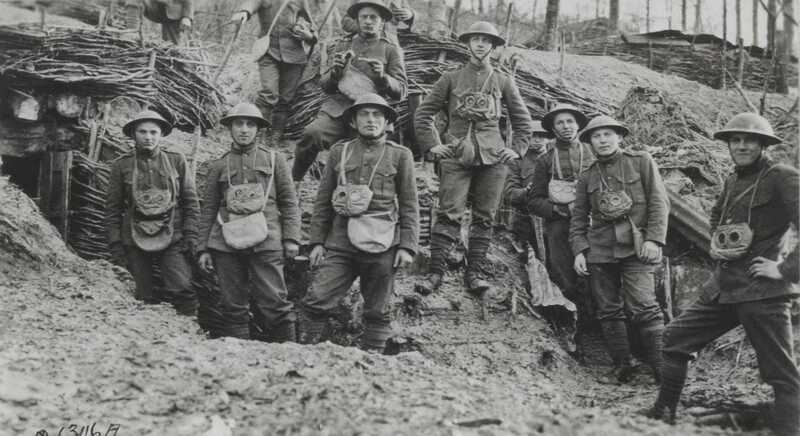 The Marines took heavy casualties during the nearly month-long, gruelling fight on the Western Front. But in the end, the Marines emerged victorious. 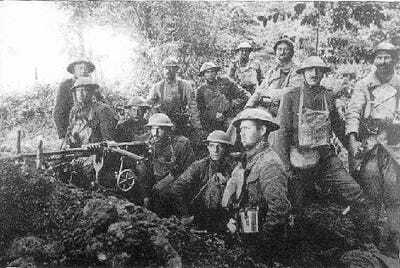 The Battle of Belleau Wood began on June 6, 1918, about a dozen miles northeast of Paris. US General John J. Pershing ordered a counteroffensive to drive the Germans out of the area, with US Marines leading the first attack against four German divisions. By the end of the day, they had taken 1,000 casualties. 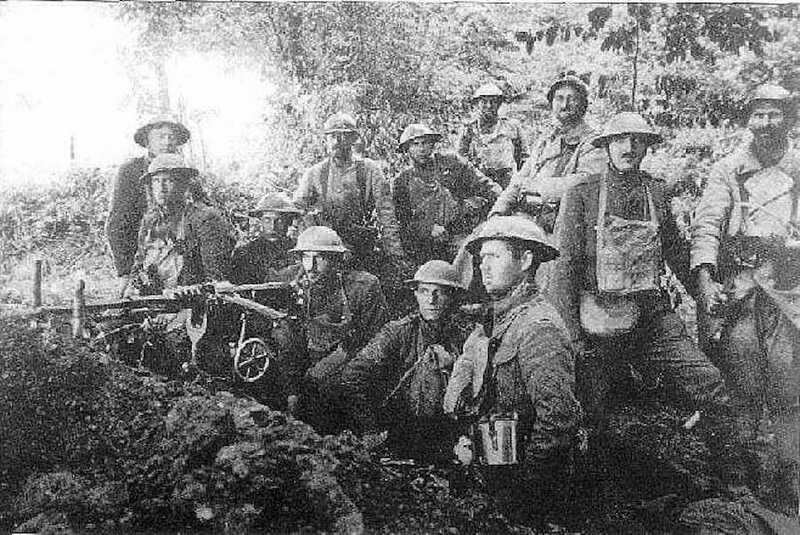 United States Naval InstituteMembers of the Marine Corps’ 6th Machine Gun Battalion & French poilus near Belleau Wood. For three weeks, the Marines launched several more assaults against the German lines, which were continually reinforced. 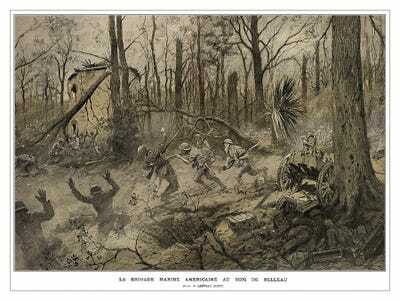 On June 26, the Marines had beaten back the Germans from the northern part of Belleau Wood. But they had taken nearly 10,000 casualties as well. Wikimedia CommonsThe 1918 illustration ‘American Marines in Belleau Wood,’ by Georges Scott (1873-1943), depicts Marines in battle in June 1918. Because of the Marines’ fierce fighting, the Germans were said to have dubbed them, “devil dogs.” But this was later debunked by Marine Corps historian Bob Aquilana. DVIDSUS Marines of the 2nd Division, who first battle was fought in Belleau Wood, stand in the trenches during World War I. Nevertheless, the nickname continued to be printed on recruiting posters after the war. One thing was added alongside it: a growling English bulldog. And this is what led to the first Marine mascot, Sgt. Maj. Jiggs. Marine Corps History Division ArchivesSgt. Maj. Jiggs wearing a Marine Corps helmet. 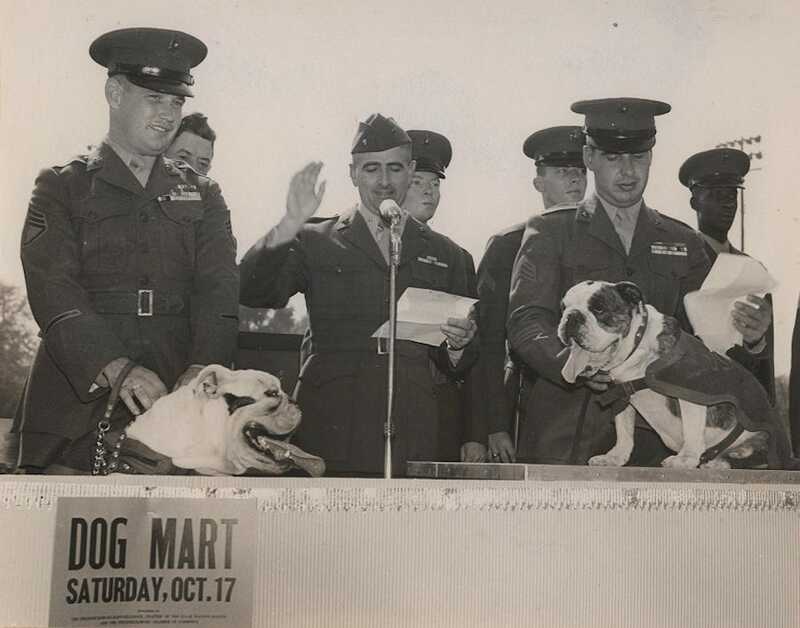 In 1921, Marine Maj. Gen. Smedley D. Butler adopted Jiggs, who later became the Corps’ official mascot in October 1922. Marine Corps History Division ArchivesMaj. 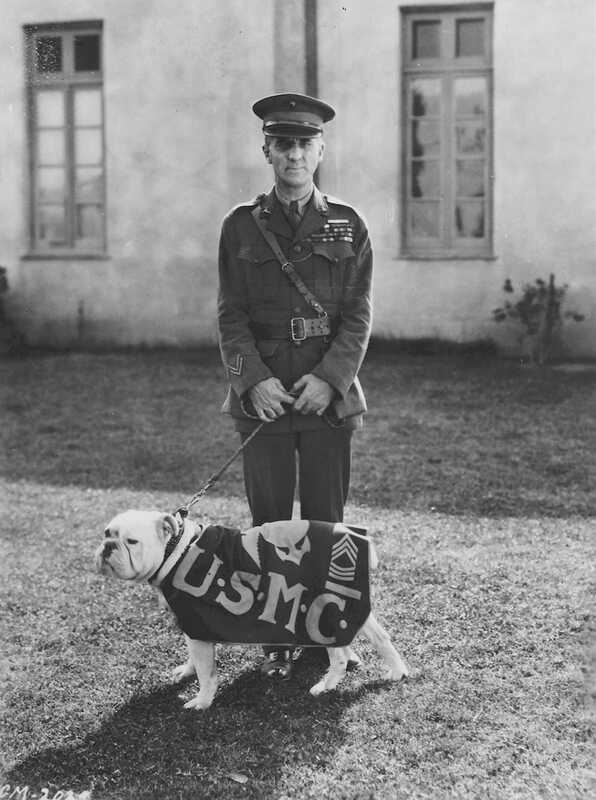 Gen. Smedley D. Butler and Jiggs pose during the filming of the Marine movie, “Tell it to the Marines,” in 1926. Butler himself, a two-time Medal of Honour recipient and author of “War is a Racket,” is still well-regarded among Marines to this day. 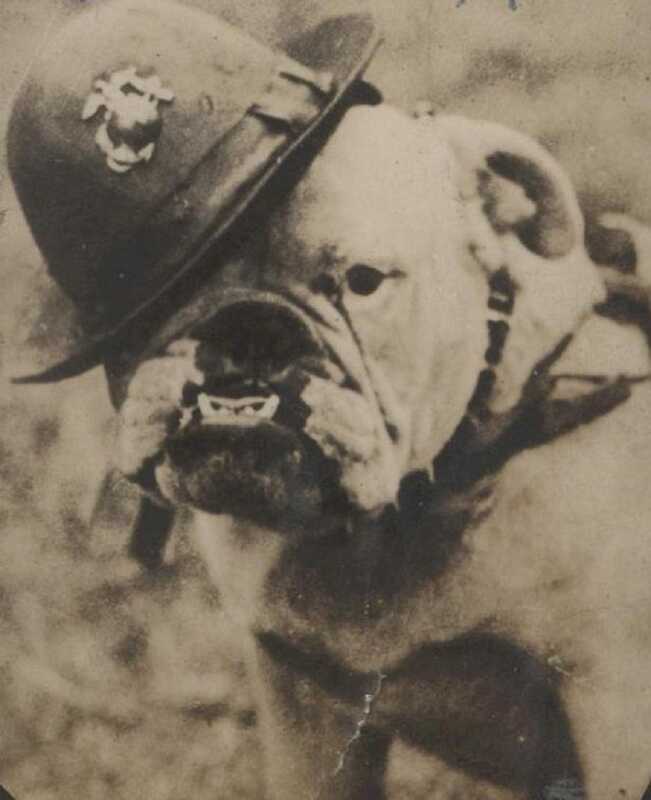 Before Jiggs passed away in January 1927, the Corps continued the new English bulldog mascot tradition, ushering in the successor, Jiggs II. Marine Corps History Division ArchivesJiggs II (right) is sworn in as the new official Corps mascot next to Jiggs I. Over the next three decades, the Corps’ mascot would be named Smedley, after the famed Marine general. 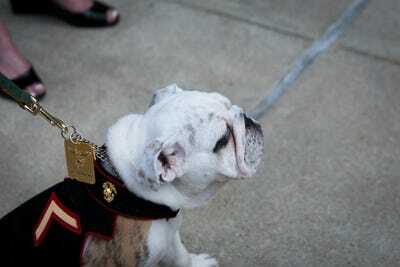 But in the late 1950s, the mascot was renamed Chesty after the legendary Marine, Lt. Gen. Lewis “Chesty” Puller. US Marine CorpsCpl. 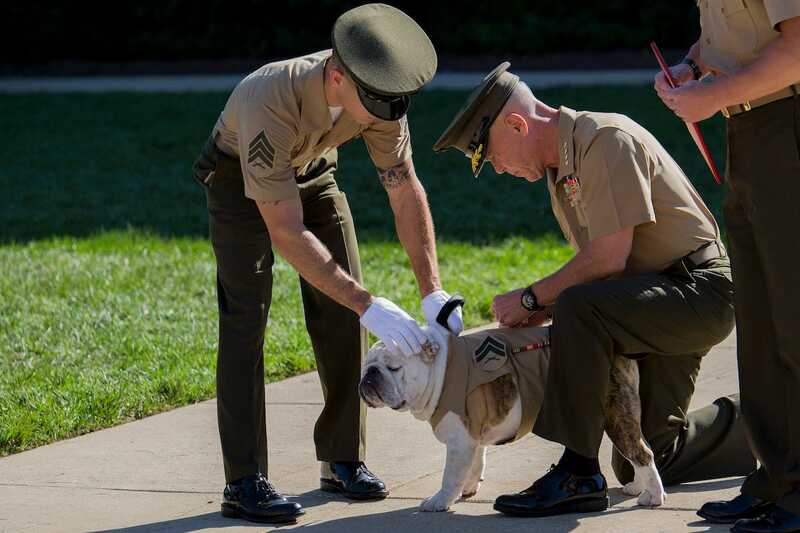 Chesty XIV gets promoted during a ceremony at Marine Barracks Washington DC on Aug. 29, 2014. Puller himself was also highly decorated, like Butler, earning five Navy crosses. But despite two attempts to upgrade one of his awards, he never received the Medal of Honour. 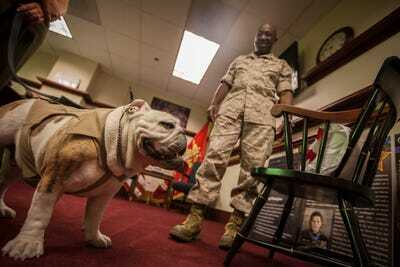 For the next six decades, there would be 14 more official mascots named Chesty, and they all fulfilled their duties. US Marine CorpsSergeant Chesty XIV (right) and Pvt. Chesty XV (left) prepare to march down Center Walk during a Friday Evening Parade at Marine Barracks Washington DC on August 3, 2018. US Marine CorpsUS Vice President Mike Pence and Second Lady Karen Pence pet Chesty XIV following the Friday Evening Parade at Marine Barracks Washington DC on May 4, 2018. US Marine CorpsPfc. 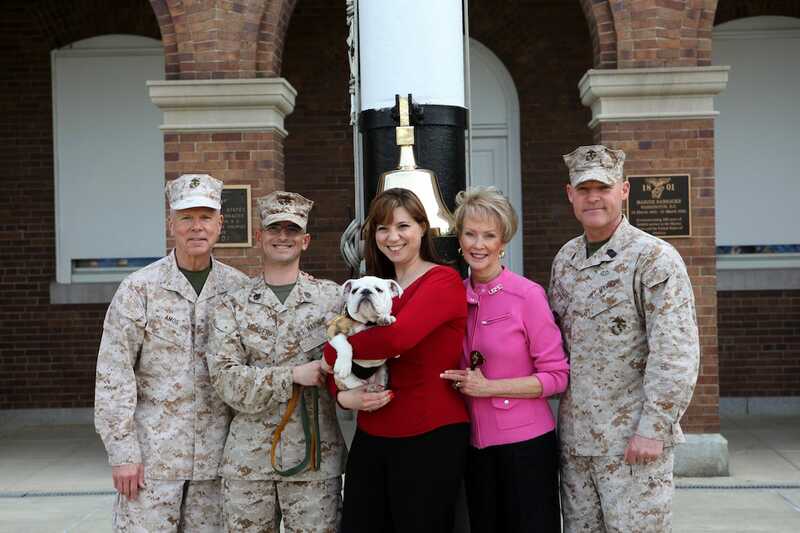 Chesty XIV poses with the 35th Commandant of the Marine Corps Gen. James F. Amos at an Eagle, Globe and Anchor ceremony at Marine Barracks Washington on April 8, 2013. And participating in morale-boosting activities. US Marine CorpsCpl. Chesty XIV visits the Office of the Sergeant Major of the Marine Corps at the Pentagon on June 25, 2015. They even went through basic training. US Marine CorpsChesty XIV at a ceremony marking the conclusion of his recruit training and basic indoctrination into the Corps in 2013.